The tailor of today can be seen as a textile contractor, specializing in being a source of custom fitting and alterations, as well as made-to-order clothing for those with the means to afford it. Given the nature of the work of a tailor, a high school diploma or GED is not a strict requirement for becoming a tailor; however, having one has never hurt. Many incoming tailors have had no formal training and few programs to acquire formal training before attaining a job exist. That being said, given the classic roots of the profession, some apprenticeship programs do persist to the present day and enrolling in these is a great way to become more competitive in the market. In either case, a tailor learns through work experience. Given the demand for this sort of work comes from all quarters, many tailors find themselves needing to specialize in a particular sort of clothing or material in order to make a brand out of it. Further, given a tailor needs to eat, these specializations tend to be in markets that have expensive base items so that their custom production or alteration can be profitable. Bridal gowns, which, according to the Huffington Post, cost over $1000 each on average, are a prime example of this. Other lucrative niches include suits and other dress clothes, as well as materials like fine fur. Beyond specialization, there is little in the way for advancement in the tailoring industry. Those who employ a tailor do so for the tailor’s ability to ply his trade. To that end, a tailor will be a tailor throughout his entire career. 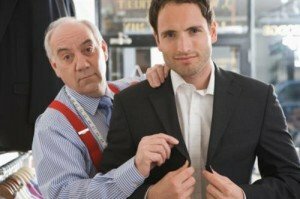 True, there may be a word or two added to the official job title before retirement or a couple of junior tailors assigned to the senior tailor in a foreman-like position, but the heart of the work is not likely to change. Those within the profession who wish to have a change of pace may go independent and run a tailoring business. In such a situation, the tailor benefits from all of that which benefits the generic entrepreneur, including a formal business education. The outlook for tailors is not particularly good. According to the Bureau of Labor Statistics, it is expected that the total size of the tailoring job pool will increase by a mere 1% or 2%, depending on niche, from 2010 to 2020. To put this in context, a 14% increase in any given industry’s labor pool is seen to be average over this length of time. This suggests that competition within the industry will be fierce and those who do not already have the skills will likely not be able to find themselves a stable position without a good deal of luck. In essence, this means that those who do not pursue the appropriate education, be it formal business training or apprenticeship programs, will likely fall through the cracks of the system and be unable to find work because of their inability to compete with formal skills. For those who are capable of pushing through this adversity to become successful tailors, the top 10% of those in the profession make about $35,000 per year, while the median pay is around $22,500 per year.